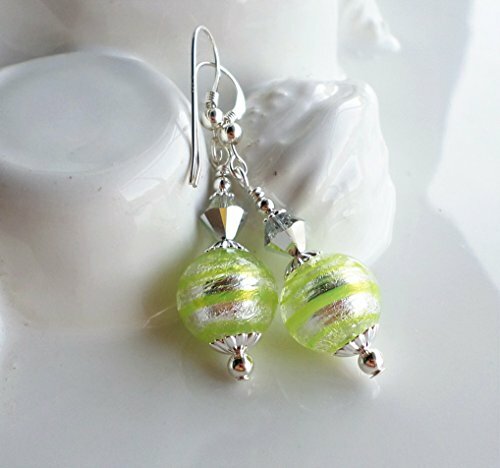 These pretty earrings feature new Murano glass beads made by skilled Italian glass makers! The round shaped beads measure 12mm each, and are made with a core of genuine 24 KT WHITE GOLD foil, accented with stripes in Lime Green! Clear glass layers are wound around the beads helping to magnify and protect their beauty. Above I have added pretty metallic silver Swarovski Crystals, STERLING SILVER ear wires and silver plated brass accents. Total length: 2 inches.